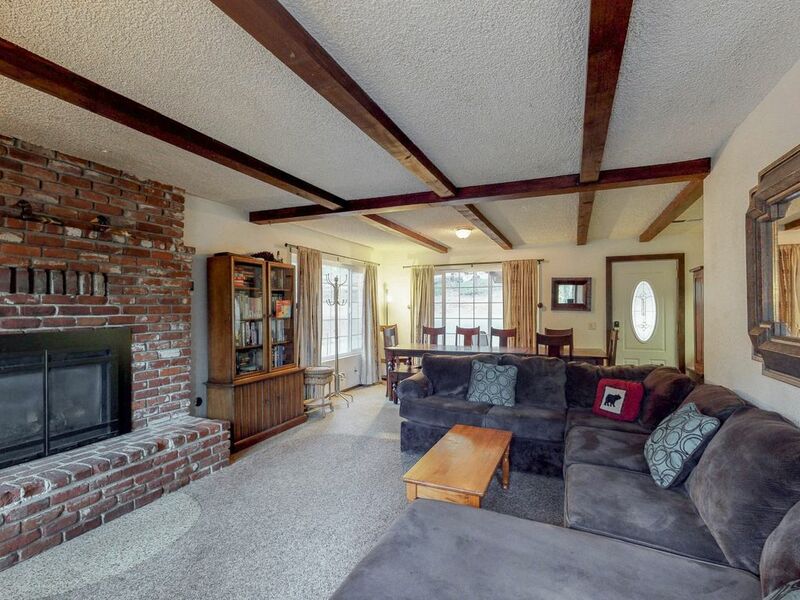 Sweet family home w/ spacious deck - right in the village, walk to the lake! Wake up in the heart of downtown Shaver Lake at this four-bedroom home, a charming California cabin with a spacious deck, a family-friendly living space, and an ideal location within walking distance of the lake! This three-level home sits on a hillside overlooking Tollhouse Road, directly across from the Hungry Hut in the village of Shaver Lake. Spend your mornings people-watching on the deck beneath a canopy of pines, take afternoon strolls to fish or kayak in Shaver Lake half a mile east, and bask in the glorious winter months on the slopes of China Peak Mountain Resort 19 miles northeast. This 2,200-square-foot home is the perfect escape for hikers, boating enthusiasts, winter athletes, or multiple families. Begin your mornings with pancakes and bacon in the full kitchen, bring the newspaper outside to the back deck, and grab your bathing suit from the washer/dryer before heading down to the lake. Practice your skills at trout fishing and water skiing, return home for lunch on the gas grill, and curl up to watch a DVD or a cable show in the warmth of the gas fireplace. Treat your loved ones to a mountain escape they'll always remember - reserve your stay at this Shaver Lake home today! * Please be aware that this property does not have WiFi and all guests must be at least 25 years of age unless accompanied by parent or legal guardian. Parking Notes: No parking on the street during winter months due to snow removal. No recreational vehicles or camping allowed in yards and driveways. Boat & Trailer Parking is only allowed in West Village & East Village. We recommend that all guests utilize Sierra Marina for a wet slip and/or trailer parking. Liked the home a lot. Kids had lots of fun. 4 bedrooms and the attic is sure to accommodate an exciting family get together. the Weekend was perfect especially with the constant snowy weekend! We didn’t have to leave the cabin because it was like we had our very own little private snow park. The only problem we had was the garbage disposal was not working and also the kitchen sink drained really slow so the sink kept getting clogged. But other than that this cabin is one of my favorite family cabin! Perfect for our large family with children! Great location, wonderful sleeping arrangements for our young ones, lots of seating, comfortable rooms for hanging out, everything clearly marked and easy to find. We had a great time! Our family enjoyed the well equipped cabin. It was like being in two areas. Front of cabin faces quaint town of Shaver Lake and the back porch looked out to wilderness. All the grandchildren fit around the table and they enjoyed the third floor with all th3 beds. Great cabin. Upon our arrival, we had to head straight to the local market to buy cleaning supplies to clean the cabin: candles and Lysol to get rid of the odor (old vacant home). Bed Headboards were dusty, kitchen is falling apart. Stiff - Dirty dish towels found in one of the drawers. Huge spiders, furniture dusty with animal hair. It has potential but very disappointed! We were given a working vacuum the following day and was informed a new one had been ordered. We were given 3 clean dish towels and 3 detergent pods. Ghost in the house? That’s what the guest book said. Quite a bit of demon and angel books? Unfortunately, this has been the worst experience during our 15 years of renting vacation homes. I rent to relax not to arrive and clean the place I will be renting. Unfortunate! Very disappointed. Again it has potential- not sure about the attic with 4 beds.